I love quinoa for countless reasons: it’s high in a protein, it has a mild flavor that makes it really versatile, it’s fun to eat and best of all it’s a quick cooking grain: 15 minutes tops, perfect for when you’re busy. 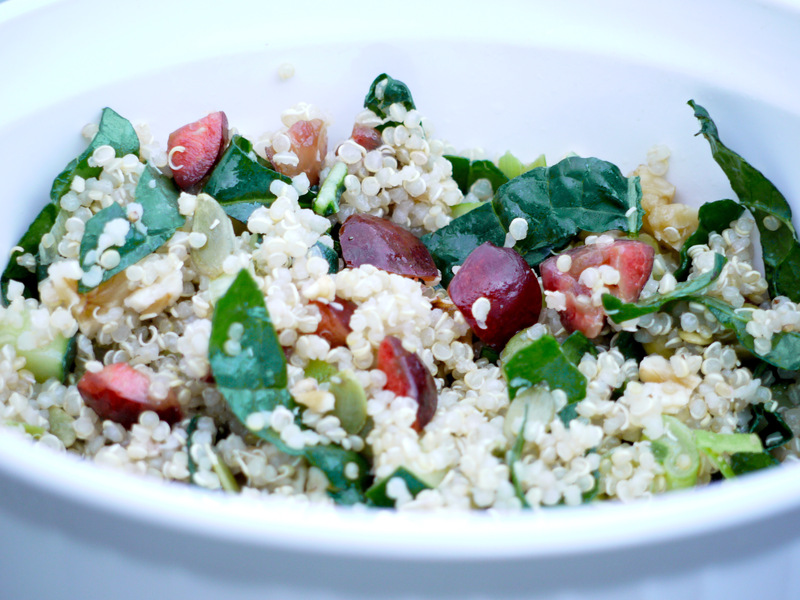 This quinoa recipe is crazy quick, delish, healthy and will keep you going for hours. It makes a great summer dinner or side dish, yummy dish to bring to a BBQ and leftovers are perfect for lunch. I hope you enjoy this recipe as much as I do. Bring 2 cups water and 1 cup of quinoa to a boil in a pot over medium-high heat. Reduce heat and simmer for 15 minutes, or until all liquid has been absorbed. While quinoa is cooking, prep cherries, kale, scallion and walnuts. When quinoa is finished and has cooled, stir in cherries, kale, scallion, pumpkin seeds, and walnuts. Drizzle with olive oil, lemon juice, season with salt and pepper to taste and mix well. Serve as a cold, refreshing summer salad.